The service is built on the 2014 acquisition of RelateIQ and mines emails, calendars, marketing apps, and other data sources to gather customer data. The service offers “smarter selling” through lead prioritization and relationship capital management (RCM) recommendations concerning contact introductions. The RCM feature is integrated into inboxes, mobile (Android, iOS), and Chrome apps. Other mobile features include an integrated inbox with the CRM, email shortcuts to quickly enter common phrases, cloud storage integration, and a notifications feed. For users in Gmail on Chrome, a plug in ties Gmail back to SalesforceIQ and supports its tools from within the Chrome browser. The Small Business service is generally available in the US, Canada, and Australia and is priced as low as $25 per user per month for up to five users. For $65 per user per month, the system provides potential introductions, CRM data in your Inbox, Sales and Activity reports, and direct integrations. SalesforceIQ is offering 14 day free trials. Pricing is based on annual contracts. The Sales Cloud edition is currently free in beta with general availability in early 2016. Sales Cloud pricing will be announced at general availability. The beta version is English only with additional languages planned. The Sales Cloud version includes a new email app where “Salesforce is your Inbox” connected to the Sales Cloud. The system automatically associates emails with contacts. Users can create opportunities from the app, respond back to the prospect with macro-based comments, and schedule a meeting using the scheduling assistant. It should be noted that SalesforceIQ is not prioritizing leads, but providing a set of recommended actions based upon the semantic mining of emails. Thus, the system evaluates whether a customer has asked a question or has been untouched for a while. Through machine learning, the system tailors recommendations based upon each reps’ style. An Opportunities Intelligence report provides “instant visibility” into account status by providing metrics such as days in current status, inactive days, last communication date, and next follow up due date. A stream view provides “a centralized view of all communications between your team and the customer.” Users can leave comments in the stream and @reference coworkers for a quick response or follow up. 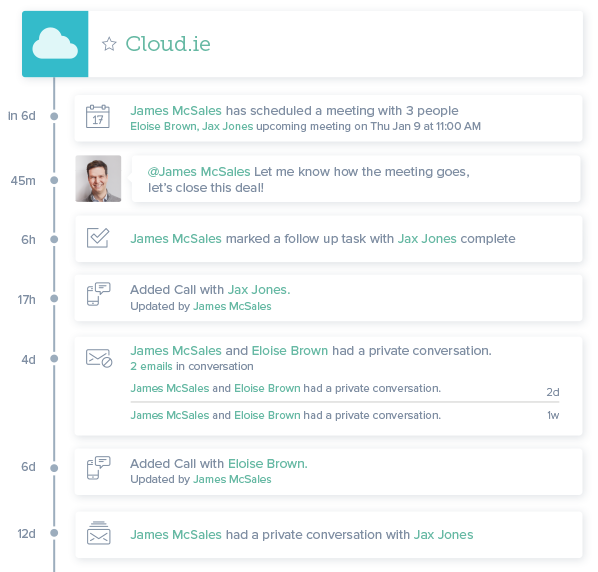 Calendaring is improved by a Chrome extension app that inserts free times into messages, manages the auto invite process with the customer or prospect, and creates the meeting in the user’s calendar. Integration partners include MailChimp, Hubspot, and Pardot. Beta customers include ClassPass and News Corp. In short, SalesforceIQ sounds like a sales rep toolkit which offers small ways to improve rep efficiency and task awareness. It is not so much focused on surfacing new insights but in reducing task work, leveraging colleague relationships, and ensuring prospects do not fall between the cracks. As such, Salesforce is a baby step in the “System of Intelligence” evolution.